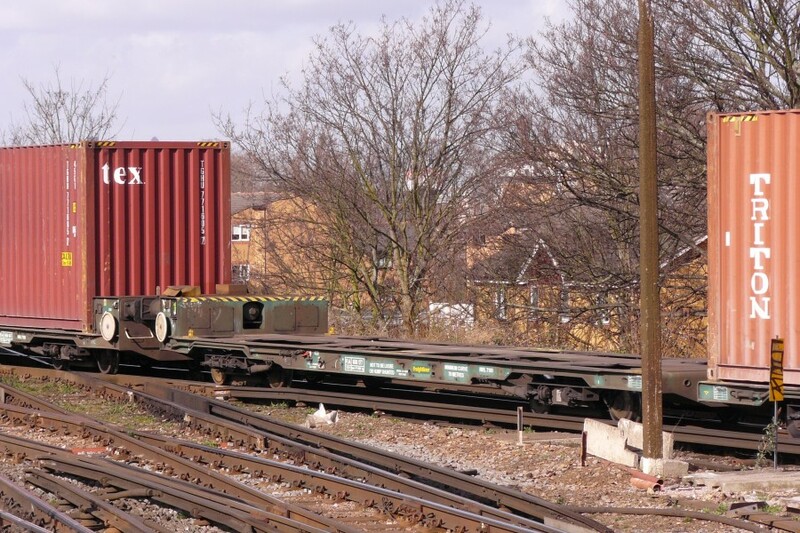 Summary: The FLA wagons are low-floor container carriers, capable of accomodating the increasingly popular �high-cube� ISO containers within the British loading gauge. Formed into 2-, 3-, 4- or 5-wagon sets, they can be seen mixed in with other wagon types on Freightliner services across the country. History: The global adoption of ISO standard containers revolutionised international freight transport, allowing cargoes to be handled and transported more easily and quickly. However, although the standard rigidly specifies the container width and length, the height is less constrained. 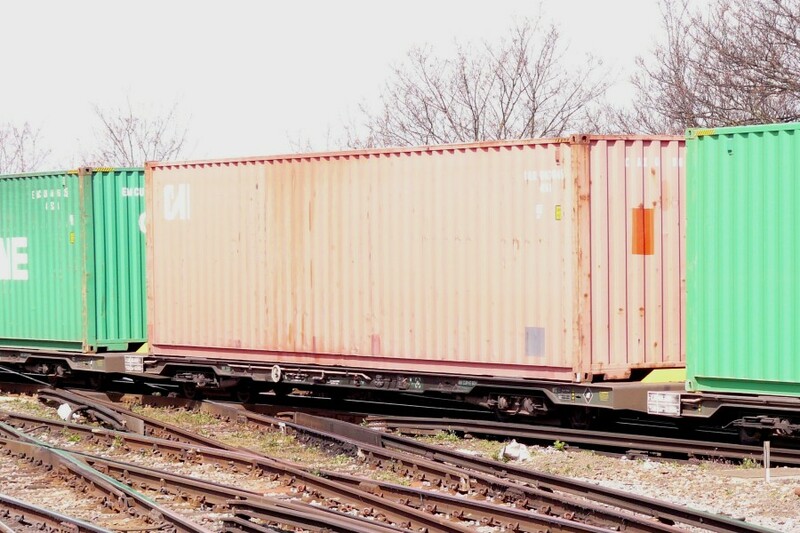 Early ISO containers were 8ft or 8ft 6in tall, these later being joined by 9ft and 9ft 6in tall �high-cube� containers. The Freightliner wagons built in bulk by BR in the 1960s and 1970s were able to carry 8ft tall containers and, following gauge clearance enhancements, 8ft 6in boxes on most routes. But for the taller boxes, which were becoming increasingly popular with shipping companies, new designs of wagon were required. The FLA was the first successful type capable of carrying �high-cube� containers but it is worth mentioning some of the other designs that preceded it. In the early 1980s, The Standard Railway Wagon Company was proposing a 2-axle well wagon rather like a stretched Lowmac (an artist�s impression was published in the book �British Railfreight Today and Tomorrow� by Geoffrey Freeman Allen, published by Jane�s in 1984). This would be able to carry 20ft long, 9ft tall boxes in the central well, or 30ft long, 8ft 6in tall boxes across the two end platforms. The wheelbase of almost 9 metres would have been more than any other 2-axle wagon (some 3-axle articulated car carriers had a 10 metre wheelbase). No more was heard of this plan. As an aside, Freightliner did make use of 100 Lowmac wagons between 1966 and 1972, modified to carry a single 20ft container each. However, the purpose of these was to provide a �wagonload� type service for traffics that did not warrant a full 5-wagon set. The next development took place in 1985 when Procor built the �Prologie�. Designed with input from both BR and German firm Talbot, this was an ultra-low-floor bogie flat wagon, intended for use carrying 9ft 6in tall containers or road vehicles. The bogies had very small wheels and inside frames, and were virtually invisible behind the solebars of the wagon. At each end, the headstocks were built up above the deck level to allow the fitting of conventional buffers and drawgear, with the brake cylinder mounted on top at one end. Given TOPS code PFA and number PR95300, the blue-painted wagon underwent running trials but was quickly found to be unsatisfactory due to guidance problems caused by the very small wheels. It was placed in storage in 1986 and survived until at least 1998. In 1988 Powell Duffryn modified former BGV steel carrying wagon W160030 (originally a Warflat wagon built in 1943) by fitting it with small-wheeled bogies developed by Gloucester. The wagon was registered for mainline use and renumbered in the private-owner series as PDUF95301 (PXA, PX051A) but it was never intended for revenue use. After trials at Derby RTC it was deregistered (by 1992). The following year Powell Duffryn built a prototype 3-wagon set of low-floor container carriers. Like the Prologie, these featured small-wheeled, inside-frame bogies and raised headstocks at the outer ends. The inner couplings were of the bar type and each wagon had a 40ft deck length. Painted in a mid-blue livery, the wagons were numbered PDUF95090 (inner wagon to design code PF054A, later JK054A) and PDUF95091/95092 (outer wagons to design code PF053A, later JK053A). They were completed just in time to be displayed at the Railfreight �89 exhibition at Cricklewood in May, full running trials commencing afterwards. With the TOPS code revisions of 1990, the wagons were changed from PFA to JKA, this being a code specifically for lowliners. As the quantities suggest, these were planned for use in nine 5-wagon sets. Like the FSA/FTA container wagons that were ordered at about the same time, the AARKND was used to distinguish inner and outer wagons, but in this case it was more logical as all FLAs had the same CARKND. The first deliveries were made in July 1990 but it was not until September the following year that all the sets were delivered and accepted for service, many having spent time in storage at either Cardiff or Willesden. Their first use (from the end of July 1991) was on services between Grain in Kent and Willesden. The low-platform height was needed here to due to restricted clearances on some of the lines through London. Livery was black with yellow headstocks and red/yellow Railfreight Distribution logos. In 1992 BR purchased the prototype set from Powell Duffryn and issued new lot and running numbers as below. The design codes were derived from the earlier PFx and JKx codes but were soon changed to FL005A and FL004A respectively. From 1993 the FLA fleet was redeployed onto national workings. It was to be over 10 years before any more FLAs were built, during which time other wagons capable of carrying 9ft 6in containers arrived (FAA and KQA/KTA). Also during this period, at least 10 of the original FLAs were placed into long-term store due to difficulties in sourcing spare parts. Probably because of this, some of the sets were reformed with two inner wagons instead of three. In 2004 one of the FLA sets was modified (details unknown) resulting in the issue of new design codes FL002B and FL003B. An order for 80 additional FLAs was placed by Freightliner in 2004 and these started arriving in the autumn. Formed into 40 twin-sets, the wagon bodies were built by Trinity at Arad in Romania and the LTF-13 bogies by CKD in the Czech Republic. The parts were transported by road to Marcroft Engineering in Stoke for final assembly. Numbers 606101 to 606180 were assigned with TOPS code FLA-B and design code FL006A and the wagons were painted in Freightliner green livery. As with the original FLAs, the batch was delayed entering service and wagons were stored at Crewe and Thameshaven for several months. From spring 2005 the wagons could be seen on normal Freightliner services, mixed in with the earlier FLAs and other types such as FEA, FSA/FTA, etc. It was announced in 2005 that the order had been extended to 400 wagons with the number range running to 606400 but (as of early 2008) there has been no sign of any more deliveries. Updates: 27/09/2014: Link to maker's webpage added. 04/04/2013: Photo links (finally) updated. 17/04/2008: Picture of first batch FLA added. First batch FLA (inner) 605014 at Lewisham, 17th April 2008. Second batch FLA 606177 at Lewisham, 26th Feb 2008.